There are a lot of online slots based on mythology and classical heroes, so it often takes something spectacular to stand out from the crowd. In Spartacus: Gladiator of Rome, casino game developers WMS have gone all out to create something that is big and bold enough to fit the genre. The standout feature of Spartacus Slot is the dual reel set, the second of which is a “Colossal Reel” which facilitates up to 100 wins per spin. The game is based on the legendary gladiator Spartacus, whose story inspired an endless stream of movies, tv shows, games and books. Is the Spartacus slot epic enough live up to the legend of its eponymous hero? Read on to find out. Spartacus is split across two interconnected reel sets. The first set is made up of five reels and four rows of symbols, whereas the second set, the Colossal Reel, is made up of five reels and 12 rows of symbols. When a game round is played, both reels spins separately. However, the sets are connected through Scatter Symbols, which trigger the Free Spins Bonus, and a Stacked Wild Transfer Feature. The latter is arguably the most exciting aspect of Spartacus Slot. Any full stack of wild symbols landing on the first reel set will transfer across to the Colossal Reel before the spin is completed. All five reels can be simultaneously transferred (the original stacks stay in place), filling both reel sets with wild stacks for a massive payout. During the Free Spins Bonus, a Nudging Wild Feature is activated. Essentially, this works the same way as the feature above, except partial stacks of wild symbols will grow to fill the reels before being transferred over. In short, there is a better opportunity to fill the Colossal Reel with those lucrative wild stacks. Use the arrows on the bottom left to select the number of paylines. You can play 20, 40, 60, 80 or 100 paylines. Use the arrows to adjust the total bet. It should be noted that each line bet is split across two paylines. For example, a £5 total bet would equate to 50 x 10p line bets, each on two paylines. The blue arrow is used to spin the reels. All features are triggered automatically. All payouts are displayed on the paytable, accessible through the coin button on the bottom of the screen. The Free Spins Bonus is activated by landing three or more Scatter Symbols across either or both reel sets. 3 Scatter Symbols = 8 Free Spins + 2x Total Bet. 4 Scatter Symbols = 12 Free Spins + 5x Total Bet. 5+ Scatter Symbols = 20 Free Spins + 20x Total Bet. Free spins are played with the same bets as the triggering spin. Spartacus slot does not offer a progressive jackpot award. However, there are lots of ways to win decent payouts, even at low stakes. The biggest awards from a spin are achieved by filling both reel sets with wild symbols, Spartacus symbols or a combination of both. At the minimum 50p bet with all lines activated, this will pay £250. At the highest bet level, £250, this would pay out £62,500. Indeed, the way the game plays with the Wild Transfer Feature and all symbols being stacked means that medium-sized wins (£30-£100 at the lowest bet) are both frequent and achievable, especially during the Free Spins Bonus. Even filling the reels with the lowest-paying symbols, hearts, spades, clubs or diamonds, will pay £50 at the lowest bet amount. Would Spartacus slot be better served with a signature progressive jackpot? Perhaps. But it is worth remembering that the focus here is all about delivering frequent large payouts through the Colossal Reel, rather than a one-off headline payout. Visually, the slot is quite basic, featuring no 3D graphics or videos. Yet, Spartacus: Gladiator of Rome slot has a pleasing design, using symbols like lions, gladiuses and the Colosseum to recall the imperial imagery of ancient Rome. A little bit more focus on the visuals might be nice, but, overall, it’s a pleasant design that facilitates a no-nonsense approach to gameplay. When the game is active, sound effects are used rather than a musical score. Indeed, winning spins are accompanied by an upbeat audio clip that doesn’t really seem to fit the slot’s theme. However, the musical score used during the Free Spins Bonus is more applicable to a “sword and sandals” epic slot. The Colossal Reel and Wild Transfer Feature provide players with plenty of excitement, not to mention frequent chances of hitting big wins. On the downside, Spartacus could do with better music and visuals, and we would perhaps like to see multipliers applied to the Free Spins Bonus to really distinguish the feature from the base game. 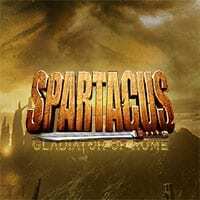 However, Spartacus: Gladiator of Rome slot is worthy of the popularity it has sustained over the last four years.